The drop-off on the side of Steffen Road is steep and getting steeper. 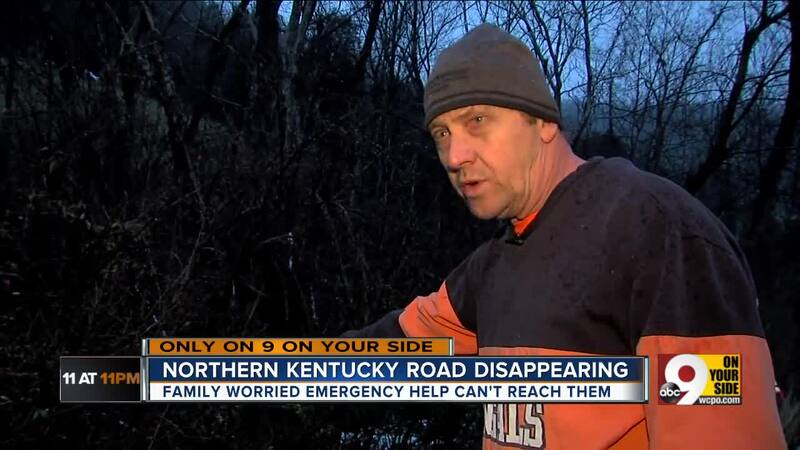 Roger Weber, who lives with his family at the end of the crumbling, curving rural street, has spent the last year in a frustrating catch-22: His road is too dangerous for services such as utilities and emergency responders to reach him but not urgent enough for Campbell County to prioritize repairs. ALEXANDRIA, Ky. — The drop-off on the side of Steffen Road is steep and getting steeper. Roger Weber, who lives with his family at the end of the crumbling, curving rural street, has spent the last year in a frustrating catch-22: His road is too dangerous for services such as utilities and emergency responders to reach him but not urgent enough for Campbell County to prioritize repairs. The slow collapse of the road became an urgent problem near the end of 2018, when Weber’s brother-in-law, who has heart failure, had a medical emergency. The ambulance called to help him couldn’t enter their home’s driveway, Weber said. His wife had to drive him to the intersection of Steffen and Licking Pike so paramedics could load him into the ambulance there. His gas company also refused to refill his propane tanks because they are too difficult to reach on the increasingly narrow road, Weber said. He and his family have enough gas to last through 2019, but they need a fix before the end of the year. “The wintertime is going to make it very, very dangerous,” Weber said. A spokesperson for the Campbell County Road Department said Thursday the repair work had been put out for a bid. The department could not predict a date at which it might be completed.